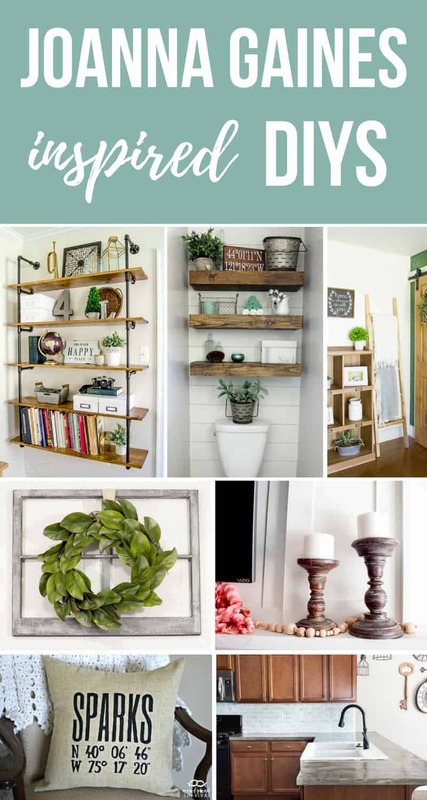 If you’re looking for ways to add more farmhouse style to your home decor, you’ve gotta see these Joanna Gaines inspired farmhouse DIY ideas! It’s really hard to put a pin on it…it’s almost like the famous chicken or egg conundrum… which came first? Only in this case, I’m referring to the farmhouse style. Which came first...Joanna Gaines or the farmhouse style? The classic farmhouse style is definitely adopted from ACTUAL farmhouses where things are cozy and comfortable with a heavy emphasis on reclaimed materials. With Chip and Joanna Gaines’ wildly popular TV show on HGTV, Fixer Upper (which is airing its last season right now 🙁 ), the farmhouse style exploded in popularity. One thing is clear…even if our girl, JoJo, didn’t “start” the farmhouse style, she has definitely inspired so many of us to incorporate bits and pieces of the farmhouse look in our homes. 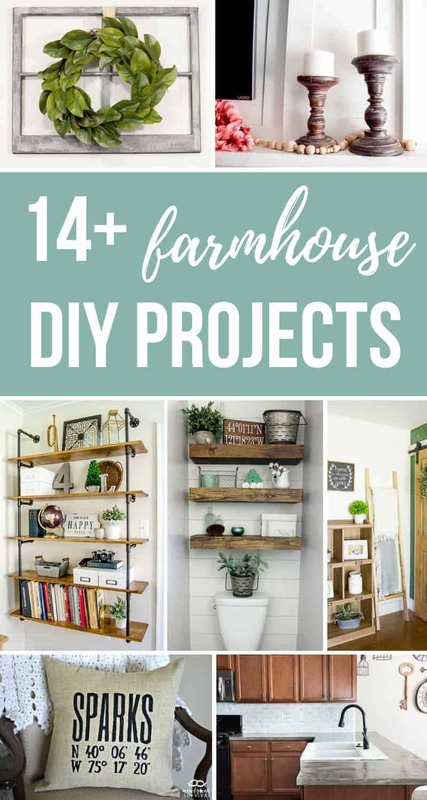 That’s why I’m sharing 14+ Joanna Gaines inspired farmhouse DIY ideas with you today. Many of these do it yourself crafts and home projects can be done in a matter of hours and on a budget! There is definitely an idea or two…or three that you’re going to want to steal for your home! Learn how to add your own shiplap accent wall with plywood. This Joanna Gaines inspired post contains affiliate links, but nothing that I wouldn’t wholeheartedly recommend anyway! Read my full disclosure here. Are you ready to see these Joanna Gaines inspired farmhouse DIY ideas?! When I think of farmhouse decor ideas I often think of recipes, especially apple pie. 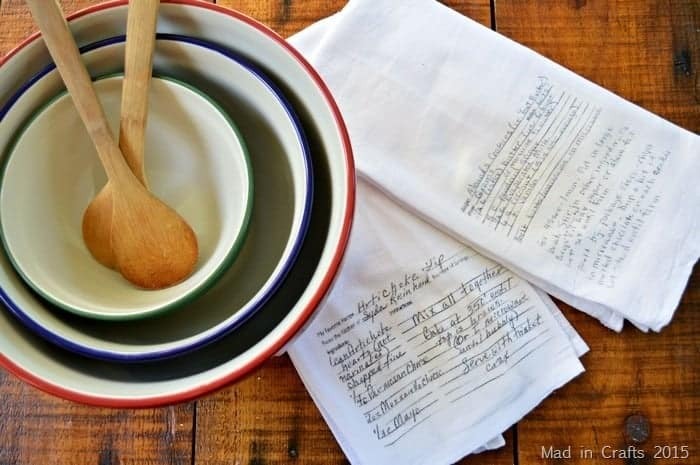 If you’ve been wanting to find a way to creatively display recipes or redecorate your kitchen, then you’ll love this tutorial from Mad in Crafts for handwritten recipes on tea towels. If you’re not looking to write out a recipe, then you can easily use some iron-on vinyl, transparent paper and your die cutting machine for a different look to this farmhouse craft. 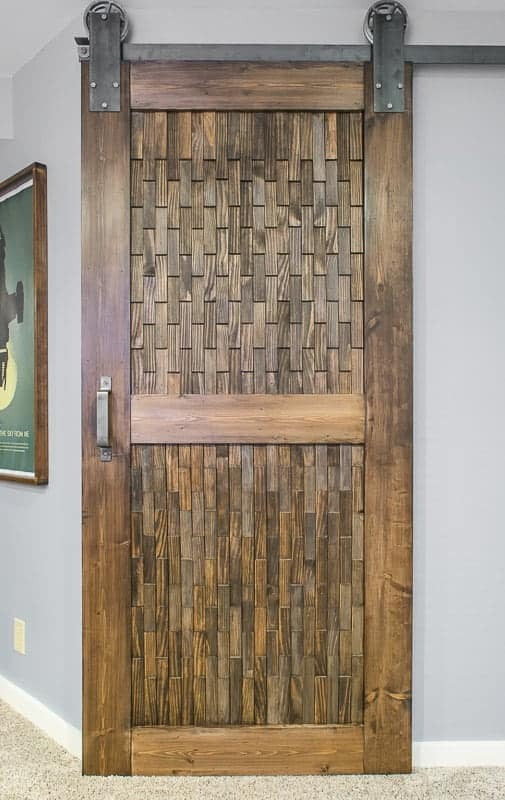 One of my favorite farmhouse decor ideas are the possibility of the barn doors inside the home. 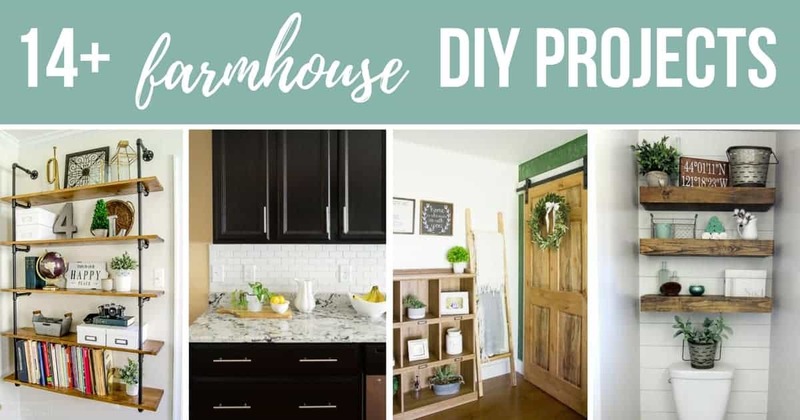 When I found The Handy Mans Daughter’s tutorial on how to make a sliding barn door, I knew I had to add this possibility to this list of Joanna Gaines inspired farmhouse DIY ideas. I love the unique texture that the wood shims add. Her easy instructions make the possibilities of having this in your home real. Plus, she also provides instructions on how to easily install the door into your home without losing your sanity. You can’t have a round-up of farmhouse DIY ideas without showing a rustic farmhouse table! I love this one that Christine from Pinspiration Mommy shares. Her tutorial for the rustic farmhouse table includes free plans with detailed measurements, so you can recreate this table yourself! 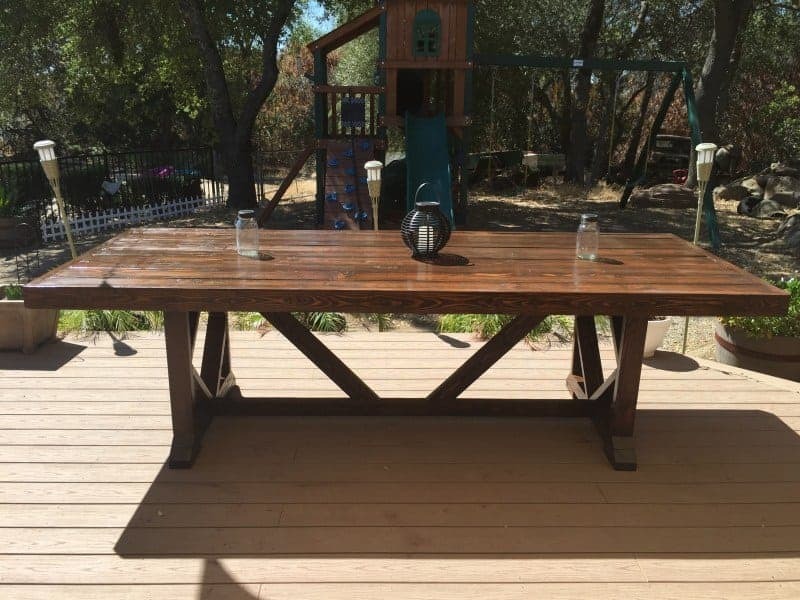 She also has a separate awesome tutorial for the DIY farmhouse bench that goes with the table. Do you look for creative ways to share the beauty of your marriage with your sweetheart? 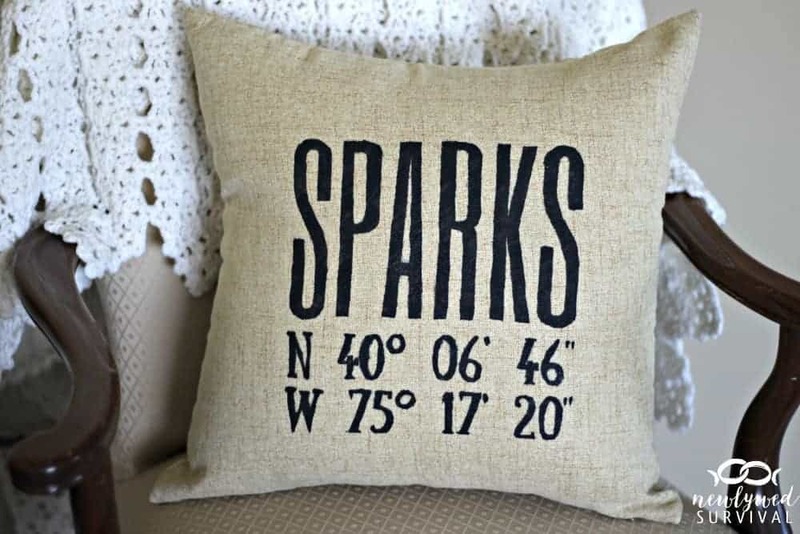 Pictures are always good, but this latitude and longitude “where sparks fly” farmhouse style pillow is simply adorable! I love the possibility of the conversations that can happen and know it’ll brighten up any chair in your home. 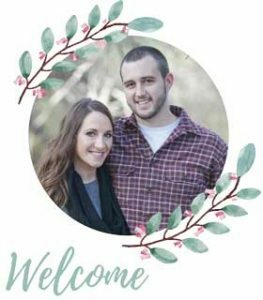 Newly Wed Survival does an amazing job at showing you how to make this simple throw pillow decoration. 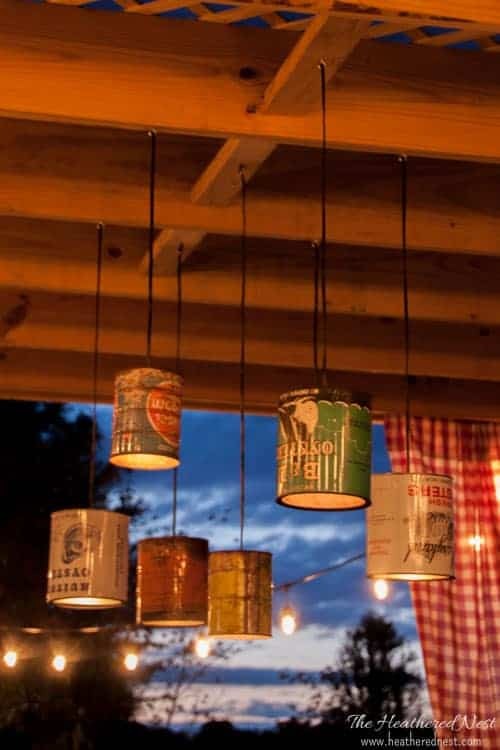 This farmhouse DIY idea brings in all the vintage charm with these vintage tin cans. Heather from The Heathered Nest created this farmhouse lighting for her deck, but it could be easily replicated indoors too. If you’re having troubles finding vintage cans like this, Etsy always has a great selection (check out them out here)! 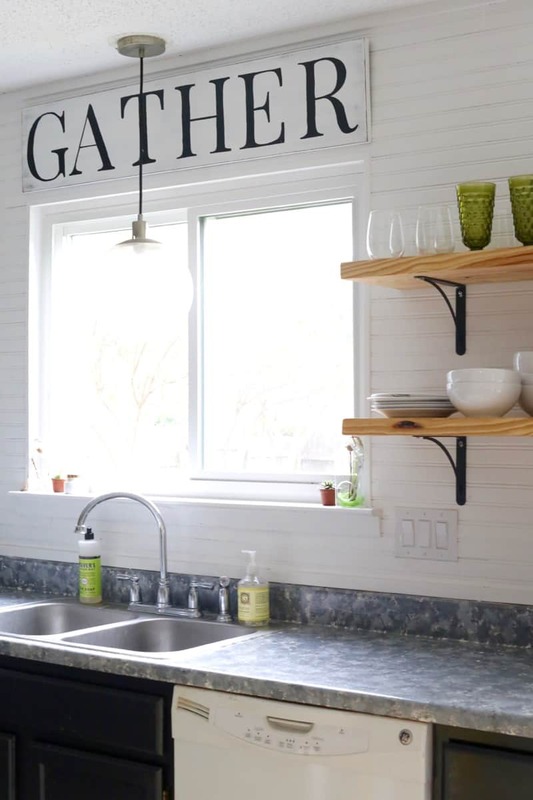 This Gather sign looks like it came straight out of an episode of Fixer Upper. Amanda from Love & Renovations nailed it on this Joanna Gaines inspired sign. Her tutorial for the Gather wood sign is super easy to follow and get this…doesn’t require a stencil cutting machine, like the Cameo (which is what I usually use to make signs). We can definitely thank Joanna Gaines for the rise in the magnolia trend…I mean her whole business is named after them. It’s hard to find an episode of Fixer Upper that doesn’t have at least one magnolia wreath in it! But, as with anything that gains in popularity, the prices soar. If you haven’t noticed lately, magnolia wreaths are a pretty penny to buy! Emily from Small Stuff Counts shows us how to make our own DIY magnolia wreath for a fraction of the cost! She only spent $16 on the supplies for this! It’s safe to say that Joanna Gaines definitely inspired our entire farmhouse master bathroom renovation! 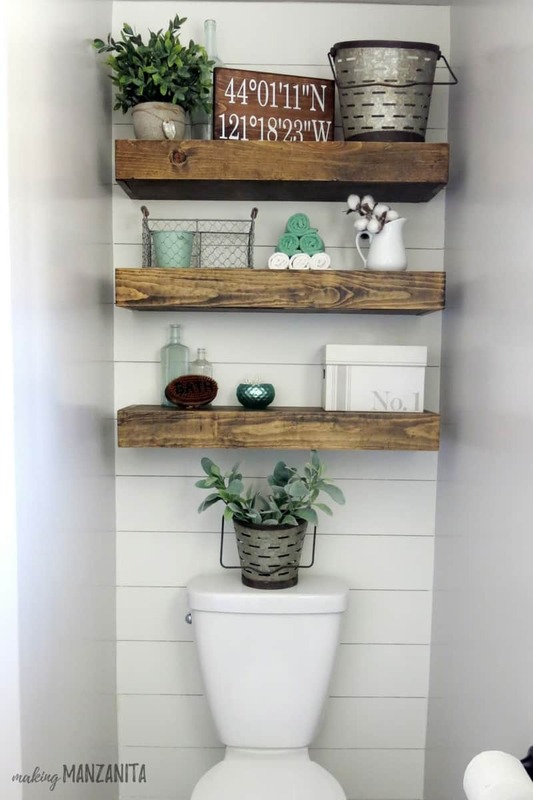 Starting with the shiplap wall behind toilet (which are faux and super easy to install BTW) and floating bathroom shelves and down to the DIY cotton stems. We had done a lot of binge watching of Fixer Upper before this farmhouse bathroom design came together. The farmhouse style inspired by our girl, JoJo, is all about shelves. The industrial pipe shelves are very popular and I, for one, love them! Adding shelves to an open wall adds a lot of character to your room. Adding open shelving to your kitchen is another great way to incorporate this industrial pipe shelf look. 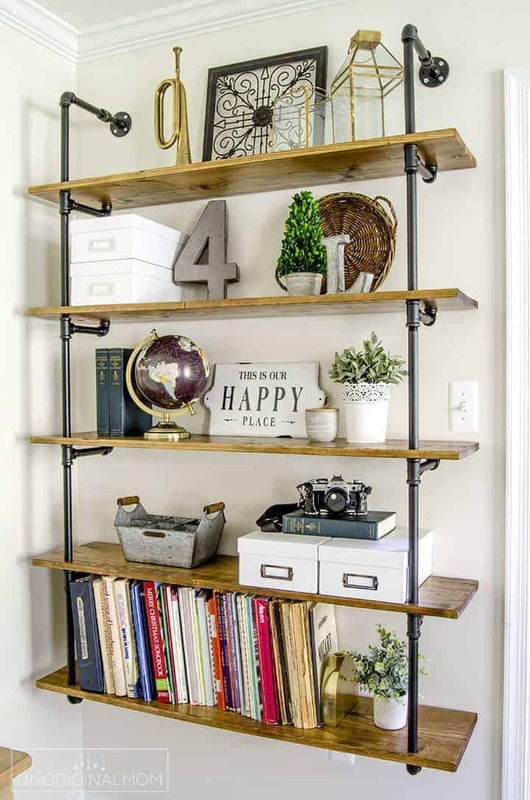 Meredith from Unoriginal Mom does a great job walking us through the steps for adding pipe shelving like this in your home. If you’re going to be adding any farmhouse shelves to your home, some candle holders are a must! They are perfect for styling those shelves by providing interest with varying heights and shapes. 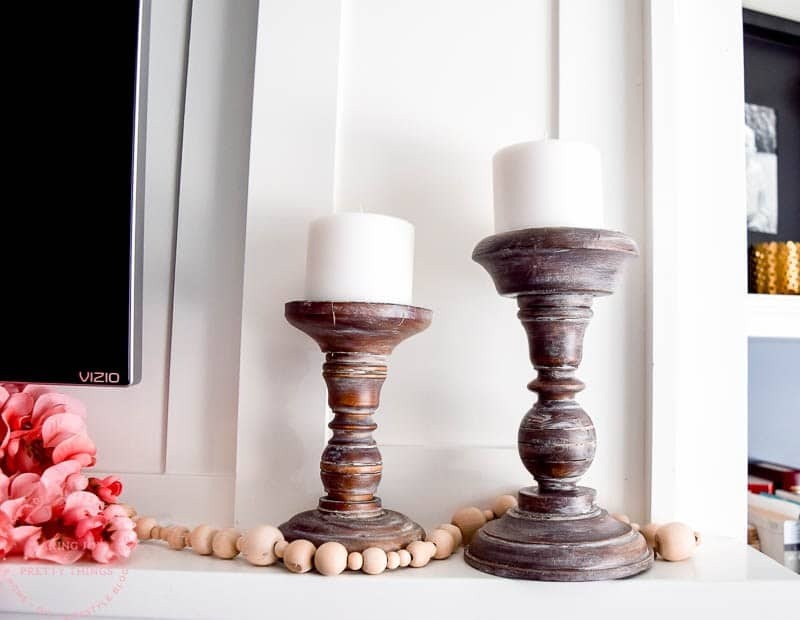 I love how Sarah from Making Joy and Pretty Things gives these wood candle holders a farmhouse makeover with one simple step. They turn out perfectly antiqued and definitely fit in with the farmhouse style. I love the classic look of subway tile, Joanna Gaines definitely does too! If you’re looking to add a little subway tile to your home, the back splash in your kitchen is a great place for it! It really brings that farmhouse look to the kitchen. John and Sherry from the amazing Young House Love give some awesome tips for installing subway tile back splash here (and they do it for under $200!). Speaking of kitchens, let’s talk about countertops! 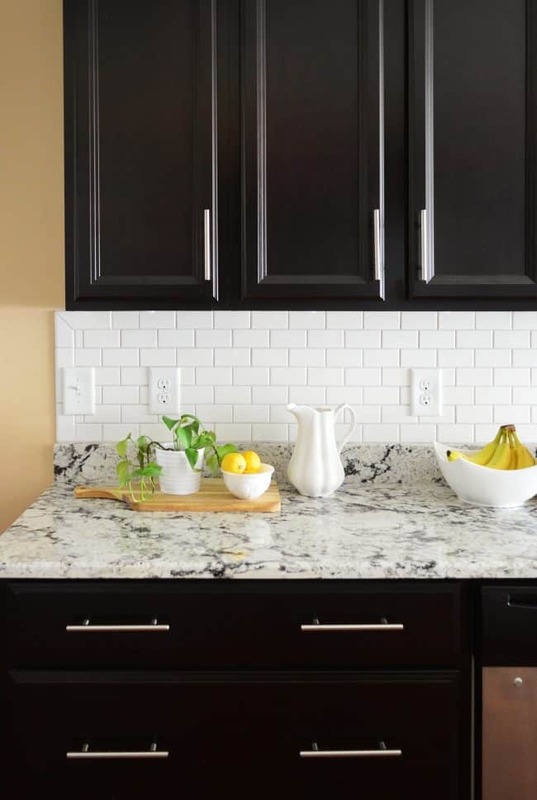 Outdated countertops can really kill a good kitchen vibe, but there are lots of ways to update them without replacing! 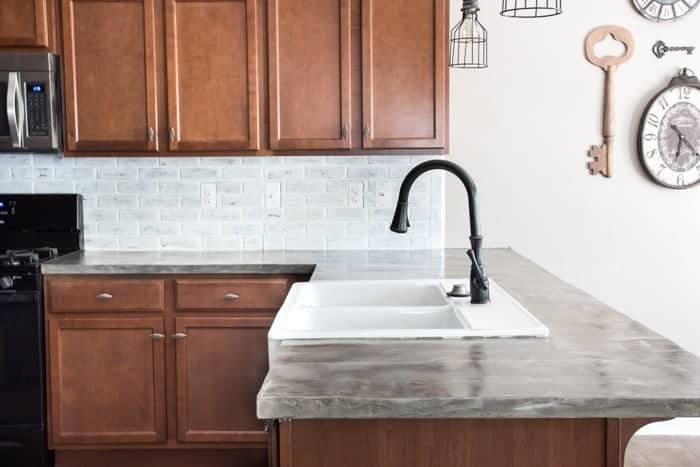 Lauren from Bless’er House shows us how they covered their formica countertops with concrete for an industrial farmhouse look and it turns out amazing! She even shares a big mistake they made on theirs to prevent it from happening to you too! When you’re designing a room, it’s important to remember that your decor can be functional. That’s actually the best kind! Baskets to hold odds and ends can be cute. Some coffee tables even provide extra storage (like this one from Amazon). This DIY blanket ladder from Kristi at Making It In The Mountains is the perfect mix of functional and farmhouse style. Wanna know the best part? She made this in less than 30 minutes! Gotta love a simple DIY project like that! Speaking of functional decor, we brought out all the stops with this farmhouse style reading nook that we installed in our living room. The bench seat lifts up to provide tons of extra storage in the living room. 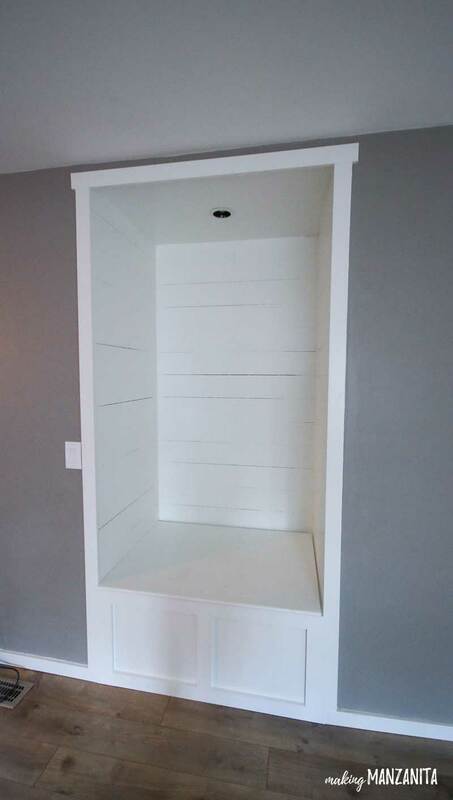 This DIY project full of lots of shiplap added a ton of farmhouse character to the room and most of all added function to this weird little alcove (which used to be a fireplace years ago, btw). 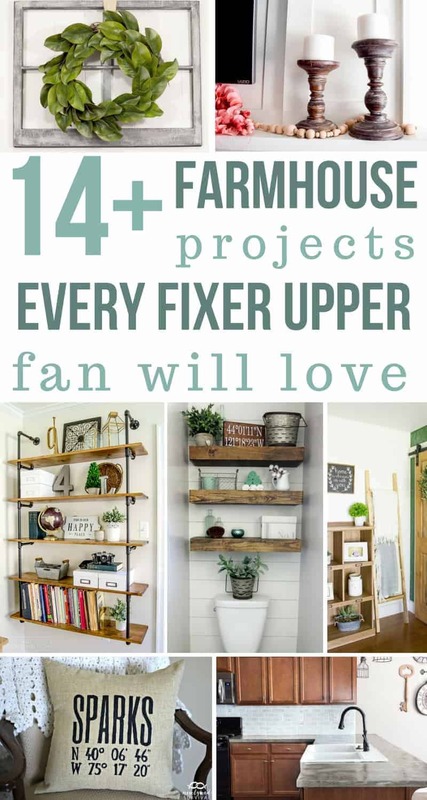 You don’t have to go to the store and spend a lot of money to buy trendy farmhouse decor to get that Fixer Upper look in your home. In fact, you’ll have a much more unique look if you make the decor yourself! 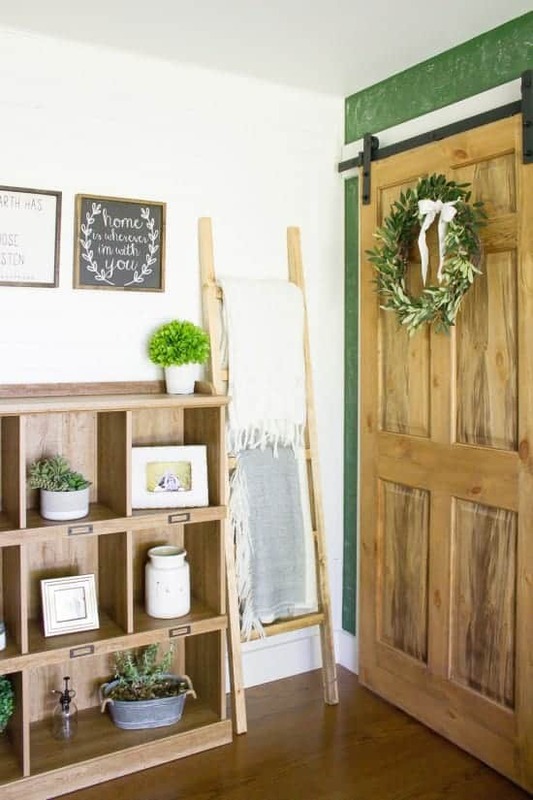 With these simple farmhouse DIY ideas, you can definitely bring out your inner Joanna Gaines! 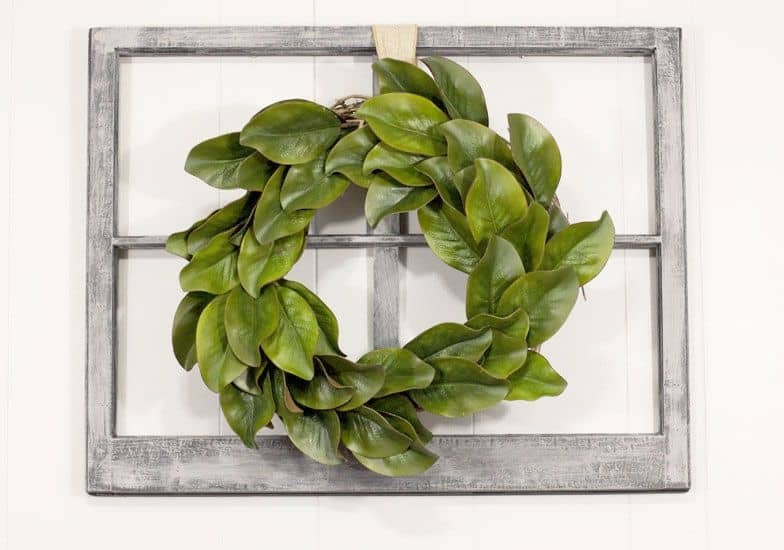 Which of these farmhouse DIY ideas inspired by Joanna Gaines is your fave?? Love the farmhouse reading nook idea! I’ve never seen that but what a nice tip. You’re right farmhouse decor doesn’t have to be expensive. Some of the neatest items were DIY projects from the dollar store. Like rustic picture frames, wood baskets and spruced up mason jars are a hit. Thanks, again for the helpful article. And I’ll be sure to share these tips!